With Michelangelo's "Last Judgment" as its backdrop, this feast of the Baptism of the Lord again saw one of the Vatican's more cherished liturgical moments of the year as B16 baptized 21 infants -- 13 boys and eight girls, ranging in age from four weeks to four months. 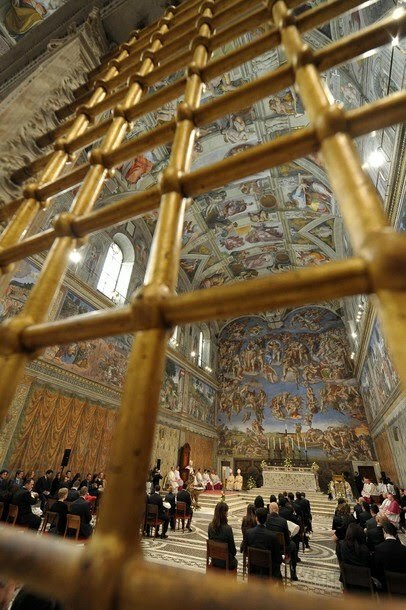 All the children of Vatican employees, the Sistine Chapel rites initiating the newborns on this closing day of the Christmas season is unique on two accounts: since Msgr Guido Marini's 2007 arrival as the Pope's Master of Ceremonies, the Baptism Mass has become the lone Capella Papale at which the pontiff celebrates "versus Deum," turned away from the congregation to join it in facing in the massive crucifix at the Sistine's back wall. At the same time -- reflecting the more relaxed, family-style feel of the event -- it's likewise the only full-tilt papal Eucharist of the year which Benedict says almost entirely in Italian (with Latin used solely at the Sanctus and Agnus Dei). "The baptism of Jesus is the gesture of He who wants to be one of us in every way and who stands in line with sinners, He who is without sin allows Himself to be treated like a sinner (cf. 2 Cor 5:21), to carry on His shoulders the burden of guilt of all humanity. He is the "servant of Yahweh" of which the prophet Isaiah spoke in the first reading (see 42.1). His humility is dictated by His wish to establish full communion with humanity, the desire to achieve genuine solidarity with man and his condition. Jesus gesture anticipates the Cross, the acceptance of death for our sins. This act of self abasement, in which Jesus wants to totally conform Himself to the Father's plan of love, expresses the perfect harmony of will and purpose that exists between persons of the Holy Trinity. In this act of love, the Spirit of God manifests himself as a dove and comes over him, and at that moment the love that unites Jesus and the Father is witnessed, by those who attend the baptism, in a voice from on high, which they all hear. The Father openly revealed to people the deep communion uniting him to the Son: the voice that resonates from on high states that Jesus is totally obedient to the Father and that this obedience is an expression of love that binds them together. Therefore, the Father is pleased with Jesus, the Son, because he recognises in the gesture Jesus’ desire to follow his will in everything: " This is my beloved Son, with whom I am well pleased " (Mt 3 17). The words of the Father, are also a prelude to the victory of the resurrection. Benedict XVI then turned to the parents of the children: "the Baptism you ask today for your children, also places them in this mutual exchange of love that is between God the Father, the Son and the Holy Spirit, for this gesture I am about to make, sweeps the love of God over them, flooding them with His gifts". And again: "Dear parents, your children are a precious gift of the Lord, who has reserved their hearts as His own, to be able to fill them with His love. Through the sacrament of Baptism, he consecrates them and calls them to follow Jesus, through the realization of their vocation according to the particular design of love the Father has in mind for each of them; the goal of this earthly pilgrimage will be full communion with Him in eternal happiness”. 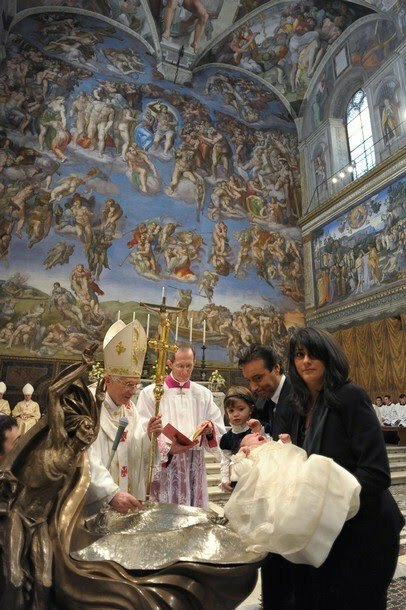 The pope recalled that since the early days of the Church, parents have asked for the baptism of their newborn babies. "Certainly, a free and conscious adherence to this life of faith and love is also required, - he added - and that is why it is necessary that, after baptism, they will be educated in faith." And he dedicated the second part of the homily to education in the faith. "The Church - said the pope - which welcomes them among her children, is responsible, together with the parents and godparents, in accompanying them on this path of growth. Collaboration between the Christian community and family is greatly needed in the current social context, in which the family institution is threatened from all sides, and finds itself having to face many difficulties in its mission to educate in the faith. The lack of stable cultural reference points and the rapid transformation to which society is continuously subject, makes the commitment to education very difficult. Therefore, it is necessary that the parishes strive increasingly to support families, as the small domestic churches in their task of transmitting the faith". While the Yuletide days have seen Benedict keep a fairly packed schedule amid the Home Office's traditional holiday slowdown, the Season's end brings little let-up: tomorrow marks the beginning of the Vatican's "civil" year with the Pope's annual New Year's "greeting" to the diplomatic corps accredited to the Holy See, a talk whose scope has earned it the widely-used nickname -- the pontiff's "State of the World" speech. Following recent months' spike of violence against Iraqi Christians -- a trend encapsulated in the Halloween siege of Baghdad's Syriac-Catholic cathedral that saw 58 killed -- the New Year's bombing of a Coptic church in Egypt (killing 23 as a Mass ended) and last June's murder of an Italian-born missionary bishop in Turkey, this year's address is likely to focus on religious freedom at-large, but with a particular plea for Christian communities living under threat. "Say No Longer 'Something is Missing'"